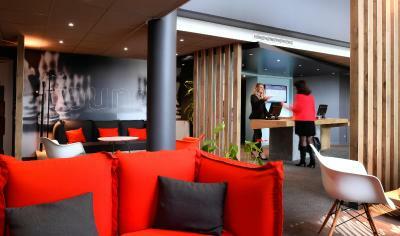 Lock in a great price for ibis Caen Porte De Bretagne – rated 8.2 by recent guests! The hotel was fairly clean, but was a budget hotel. We were not aware of this when we booked. There were no extras of any kind, but it was clean and ok for 1 night. The breakfast the next morning was find with good pastries and a coffee machine to make whatever you liked. close to the caen ring road, easy to find, clean rooms and polite stuff. Convenient location just of the freeway. Nice modern rooms. Incredible spread for breakfast. Decor & bedroom comfort & shower room pod ingenious. The design of the room, especially bathroom. Very quiet room. Great location for forward journey. Access to restaurant was very good. Comfortable and clean room. All that we needed for one night. Staff kind and professional. Great location, quality accommodation and friendly staff. The room was clean, the shower / toilet and air con excellent. 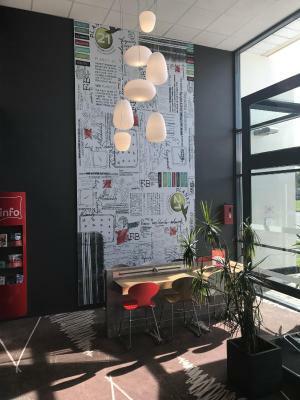 Located 3.1 mi south-west of Caen, this Hotel Ibis is entirely air conditioned and offers modern rooms. 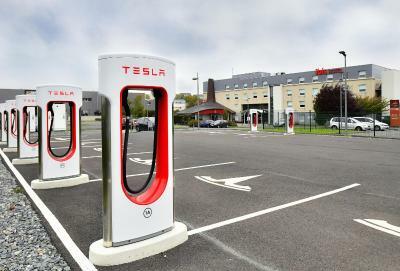 It is easily accessible via the A84 motorway, exit 9, 2,950 feet away. 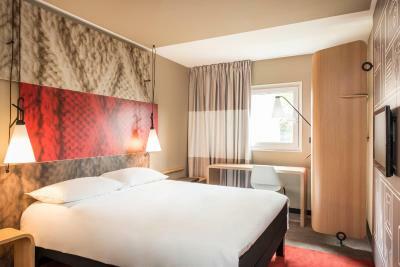 All of the rooms at the Hôtel Ibis Caen Porte De Bretagne are equipped with a TV, a radio and a telephone. They each have a private bathroom with shower. 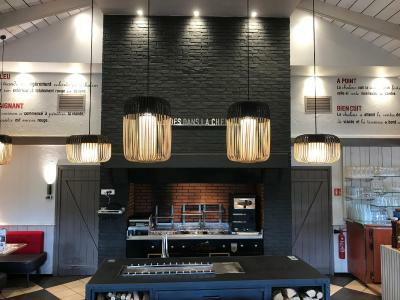 The restaurant, La Courtepaille, serves meat dishes, grilled on the central fireplace. Guests can also relax with a drink at the bar. 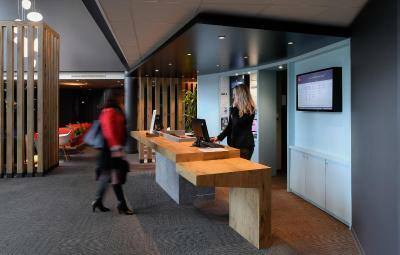 Front desk is open 24 hours and free Wi-Fi access is available in the entire Hotel Ibis Porte de Bretagne. Caen Carpiquet Airport is 2.9 mi away. 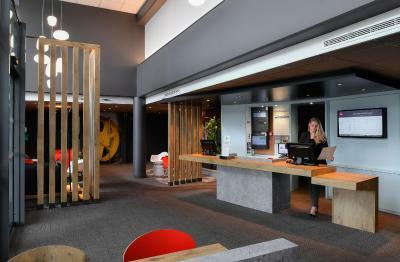 Guests can visit the Caen Memorial Museum, 3.1 mi from the Ibis Porte de Bretagne. Free private parking is possible on site. This property is also rated for the best value in Bretteville-sur-Odon! Guests are getting more for their money when compared to other properties in this city. 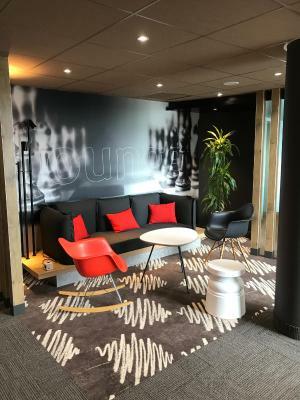 When would you like to stay at ibis Caen Porte De Bretagne? The air-conditioned rooms include a TV, a telephone and an private bathroom. 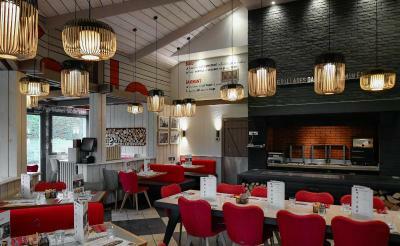 House Rules ibis Caen Porte De Bretagne takes special requests – add in the next step! ibis Caen Porte De Bretagne accepts these cards and reserves the right to temporarily hold an amount prior to arrival. Lights with draping wires not functional with draping wires. Restaurant had many items 'unavailable' including Calvados!! Restaurant was a major disappointment. When booking, Ibis makes a reservation on your creditcard. You would expect this reservation to be returned as soon as you have payed. Not so. 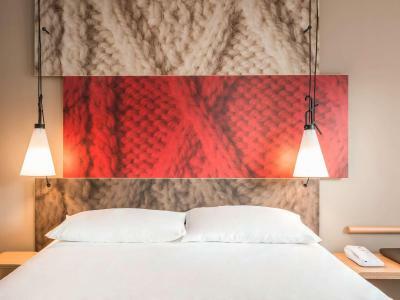 Ibis holds this reservation for a month and does not inform you about this! Ridiculous. You should be able to make a cup of tea/coffee/chocolate in your room. When I made a resevation via Booking, the price included sleeping, breakfast and supper. The price was excellent for this combination. After arrival I was notified, that the supper is not included, it has been a mistake (by Booking or Ibis????). They charged me less. As I counted on evening meal in my reservation, I did not stop elsewhere for eating. The additional expense for supper in restorant at hotel was the much more expencive as in my reservation by Booking. The layout of the breakfast facilities was spread around the restaurant, which we found confusing, otherwise a very good breakfast. The only negative was that we first got a room which was not cleaned up. But the staff immediately changed it to another one.